Acknowledged as one of the country's premier personal trainers by numerous publications, Douglas Brooks is truly the "Trainer's Trainer." As an author, lecturer, trainer and video personality, his knowledge of fitness is recognized by professionals and the public worldwide. 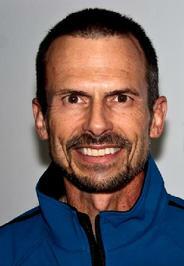 Douglas, who holds a Master's Degree in exercise physiology, is the author of five best selling books. He has also authored numerous educational manuals. He frequently conducts lectures and workshops on exercise physiology, kinesiology, strength training, and personal training throughout the United States and internationally. Douglas is the consulting exercise physiologist for product research and development for several fitness companies. A personal trainer for 25 years and counting, Douglas is no stranger to video and TV production. He has been the featured talent in over 20 videos. Douglas regularly appears on cable television as a fitness expert, and the Health Club Cable Network. Douglas hosts Snowcreek Fit Tips on local cable television. His motivational theme, "Commit, To Get Fit!" -- runs daily. A person who enjoys fitness activities of all kinds, Douglas is a competitive tennis player, marathon runner and Ironman® triathlete, an avid alpine and Nordic skier, in-line skater, rock climber and mountaineer. Douglas lives near the top of a mountain in Mammoth Lakes, California with his wife Candice and their two sons, and cross-trains with all the toys according to the season.